Stock # 2558, 4.8L V8 OHV 16V, 6-Speed Automatic, 112608 mi. 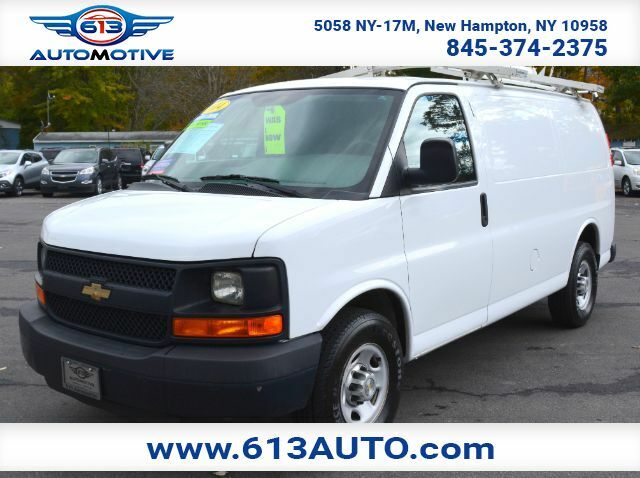 No matter what the mission, our 2014 Chevrolet Express Cargo Van 2500 proudly displayed in Summit White is a versatile vehicle that can take a beating and still handle a massive amount of cargo. Powered by a 4.8 Liter Flex Fuel V8 that provides 280hp while paired with a 6 Speed Automatic transmission with tow/haul mode. With a range of options, this Rear Wheel Drive Work Van supplies all the space you need and the power to tow up to 9,900 pounds. This 2500 Work Van is a jack of all trades with 60/40-split swing-out right-side doors and swing-out rear doors. Inside our Cargo Van 2500, long workdays won''''t seem too long as you can find comfort in high-back reclining bucket seats and air conditioning. There is a trip computer, a convenient console with storage, cup holders and two power outlets to keep you charged. You''''ll appreciate the durability enhanced by durable floor covering, durable seating and protective inner door panels. You will be protected with Chevrolets anti-lock brakes, stability control, and a tire-pressure monitoring system. Tried and true, this van will help you get the most out of your investment. Print this page and call us Now... We Know You Will Enjoy Your Test Drive Towards Ownership!